Aylmer's attack began with an advance by 4,000 troops of 7th Division, preceded by short artillery bombardments at noon on 20 January and on the morning of 21 January. The sole effect of the weak bombardment - which fired a miserly 12,000 rounds - was to warn Khalil of an approaching attack. 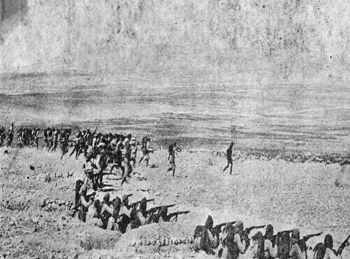 The Battle of Hanna was a World War I battle fought on the Mesopotamian front on January 21, 1916 between Turkish and Anglo-Indian forces. After Turkey's entry into the First World War, Britain dispatched Indian Expeditionary Force D to seize control of the Shatt al Arab and the port of Basra in order to safeguard British oil interests in the Persian Gulf. Eventually, the Anglo-Indian force's mission evolved into the capture of Baghdad. However, despite victories at Qurna, Nasiryeh, and Es Sinn, the primary offensive component of I.E.F. "D", the 6th (Poona) Division withdrew southwards after the Battle Ctesiphon. The Turkish forces in the region, reinforced and emboldened by the withdrawal from the gates of Baghdad, pursued the Anglo-Indian force to the town of Kut-al-Amarrah. Strategically situated at the confluence of the Shatt-al-Hai and the Tigris River, the commander of the Ponna Division decided to defend the town. On December 15, 1915, Turkish troops had surrounded the Anglo-Indian force of about 10,000 men at the town of Kut-al-Amara. The British commander Major General Charles Townshend called for help, and the commander of the Mesopotamian theatre General Sir John Nixon began assumbling a force of 19,000 men to relieve the besieged forces.. This relief force, designated as the Tigris Corps, initially consisted of 2 divisions: 3rd (Lahore) Division and 7th (Meerut) Division, as well other units available in the region. 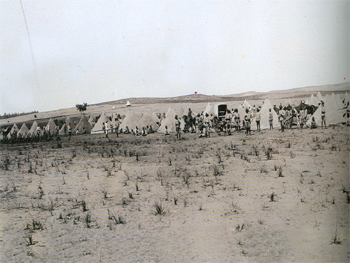 This relief force, commanded by Lieutenant General Fenton Aylmer, suffered two setbacks during its initial January 1916 offensive (see the Battle of Wadi). After these defeats, the relief force (now reduced to around 10,000 men) was ordered once again to attempt to break through the Turkish lines and continued it's movement up the Tigris until it encountered 30,000 of the Turkish Sixth Army, under the command of Khalil Pasha, at the Hanna defile, 30 miles downriver of Kut-al-Amara.